This former Christian basilica is now a museum and one of the greatest surviving examples of Byzantine architecture in the world. The famous dome and minarets can be seen from all around and it tends to be a rather busy attraction. We waited around 30 minutes to buy tickets, but it was definitely worth it. The interior is filled with mosaics and marble pillars and you’ll come out with a sore neck from all the craning. 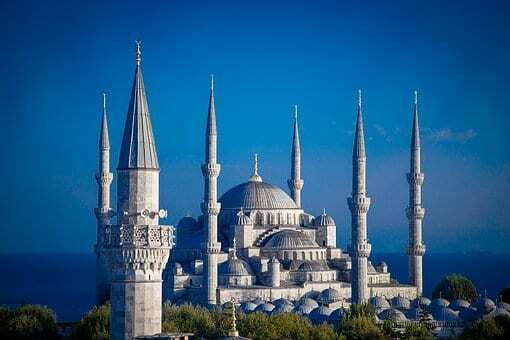 The functioning Mosque is just a minute walk from Hagia Sophia. It gets its nickname from the blue coloured tiles that surround its interior. This was the highlight of my trip and, although there was a queue to get in, it was well worth it. You must remove your shoes before entering, and ladies must cover their heads. There are plenty of headscarves available to borrow on entry, so you needn’t take your own. The Mosque has a massive main domes, 8 minarets, and 6 further, smaller domes. These give it its beautiful shape. Sultan Ahmet is widely considered to be the last great Mosque of the Classical Period. It’s also worth going back to see at night when people crowd around the nearby fountains. This is mainly because the Mosque is fabulously lit against the dark. The Blue Mosque and Hagia Sophia can be accessed on the tram at the Sultan Ahmet stop. Descending 52 stone steps into the cavernous vaults below the streets of Istanbul will lead you to the Sunken Palace. James Bond fans might recognise it from 007’s adventures in ‘From Russia With Love’, and Dan Brown enthusiasts from final scenes of ‘Inferno’. I was way too busy marvelling at the dark and creepy interior, which was made even darker as we’d just come out of the brilliant sunshine. I spent much of my time trying not to lose LT as he darted around taking photos. Luckily, I managed to hear his soft Scouse accent in amongst the throngs of foreign tongues. After spending the following morning checking out our neighbourhood, we spent the afternoon relaxing in the Istanbul sun and enjoying local cuisine. We stumbled upon the tiniest café, with a food cart outside serving up chicken breast, white rice and chickpeas. It sounds simple, but it was sooo tasty and incredibly cheap. On each tabletop in the Café (by which I mean both of them), were clay pots with whole chillies in them. I stuck a couple in my chicken pilaff and proceeded to make lots of odd noises as the inside of my mouth melted away. They. Were. Fabulous. So fabulous, in fact, that I bought a jar to take home with me. After setting my chops on fire, we moved on to some Turkish apple tea. This is often served cold with a bit of sugar to sweeten the taste. We rounded off the late afternoon with a few‘Efes’ beers in the shadow of the Blue Mosque. We thought we’d take the day and head out on a cruise on Istanbul’s Bosphorus River. There are many boats to choose from for a trip, with varying fees. We haggled on prices with some vendors outside and got a great deal on a short circle cruise around The Golden Horn. We hopped aboard at the dock got a fantastic view of all the Minarets of Hagia Sophia and The Blue Mosque. W peacefully floated around the river for an hour, beneath the massive bridges that carry vehicles between Europe and Asia. We also got to sail around Maiden’s Tower, which sits on a little islet on the river. It was featured in the Bond movie “The World Is Not Enough’. I’m not actively trying to visit Bond movie sets; it just so happens that there are two of them in Istanbul. Cruising the Bosphorus gives you a great sense of the size of Istanbul. It also provides wonderful views of the unique skylines on both sides of the river. Once back on dry land, we hit up Topkapi Palace and Grounds. Now a major tourist attraction, it was previously home to the Ottoman Empire for 400 years. It is now a museum and holds extremely valuable artefacts from the Muslim religion, which include Muhammed’s cloak and sword. Topkapi is also a UNESCO world heritage site and is one of the best surviving examples from the Ottoman Empire. As well as the interior, it also has huge grounds and beautifully manicured gardens. It seemed to be a popular hangout for sunbathers and it’s wise to set aside a good few hours to experience it fully. Topkapi is located within a few minutes walk of The Blue Mosque and Hagia Sophia, so everything is in close proximity. We spent a full seven days in Turkey, but our trip to Cappadocia and the Grand Bazaar were fully deserving of their own posts. Also: the Travel Bug came with us to Istanbul and added to his series of Fascinating Facts. What are your must-see sights in Istanbul?